This Multi-Circles Wall Mirror is no doubt a beauty. Fashioned for contemporary spaces, this would make a great accent and statement piece inside your home. Instead of large piece, this one is crafted with 15 circular mirrors in different sizes. These are cleverly attached to take on an amorphous feel. 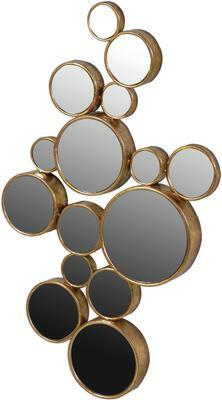 Each mirror comes with a lovely gold frame, allowing it to have that subtle elegance that's great for any modern space. Hang this in your hallway to help broaden up the space or maybe use this in your lounge area. It's carefully handmade so it's guaranteed to be of top quality.